For those of us thinking about our New Year’s resolutions, self improvement is generally the goal. Given the chance to reflect on our past year, we may find we have gained weight, neglected to exercise, eaten poorly or just didn’t take good care of ourselves. While some of us might resolve to get a better job, save money for the future or find our true love, many will simply want to eat better, get in shape or improve their health. For sure, we should give ourselves credit for what actually went right this year and with a concentration on the positive aspects of our lives, we can begin to set goals for the new year. Ask yourself what went well and what didn’t go so well in 2014 and what you would like to accomplish in 2015. And keep in mind, the more realistic your goals the more likely you are to achieve them. A habit is an acquired behavior that is repeated so many times it becomes an ingrained, unconscious action. Habits can be good or bad depending on how they affect your life or those around you. Good habits, such as arriving on time, or brushing your teeth before bed, are normal and often helpful, as they free up our brains to focus on things that require our attention. Bad habits, such as texting while driving or arriving late to work, can negatively affect our lives or damage our careers. Most of us have at least one irksome, if not unhealthy, habit which is generally the result of stress or boredom. Perhaps you’re a nail biter, a fidgeter, or a hair twirler. Maybe you are habitually late or you skimp on sleep, excessively surf the internet, drink a bit too much or too often or are still sneaking outside to have a smoke. All bad habits are difficult but not impossible to eliminate. A combination of strategies is often needed to be successful in overcoming undesirable behaviors. While we are all basically creatures of habit, we also have the ability to improve our self control and change our behavior over time. While there are no single strategies that will work for everyone, the key is to develop effective ways to suppress bad habits and replace them with more positive behaviors. Recognition is the first step on the road to good intentions. Then you will need a concrete plan to work on your most damaging habits first. You will need patience and persistence, as breaking a habit can take anywhere from 2 weeks to 8 months, with an average of 66 days. Many of us give up way before that amount of time has passed. In fact, according to the 2014 Journal of Clinical Psychology, only 8% of us manage to achieve our New Year’s resolutions. Once you have committed to change, establish a plan to get where you want to be. It’s not enough to simply say, “I’m going to eat healthier or exercise more.” Make a schedule of the days and times you will get to the gym or get outside to walk and then commit to it. Make a shopping list before you head to the market and skip those treats that will sabotage your healthy eating plan. Identify the triggers that make it easy to fall back. If you know you will choose unhealthy meals when you go out to dinner, plan to eat healthier meals at home more often or check out the restaurant’s online menu and decide in advance what you will order. Small steps result in big changes. Most of us set our goals too high and are disappointed when we don’t achieve them. Some people may find it effective to quit a behavior all at once. For others, breaking a bad habit down into reasonable bits helps them to take the necessary steps to change the behavior. If you want to eat healthier, try switching out that morning donut for a piece of fruit or a yogurt. When you repeat this action, it becomes the norm and you will begin to form a new habit, which has the potential to keep you from falling back on your old ways. Then you can take on other small challenges to improve your overall diet. Experiment to find what works for you to keep you on track with your plan. Habits are powerful, largely mindless behaviors. Constant awareness is necessary if you want to block your usual actions and reach your personal goals. For some, this may mean changing the environment to avoid situations that can trigger bad habits. If everyone goes to happy hour after work on Friday, but you know you may have one too many if you join in, find another friend who might like to go for coffee instead. (Hey, no one said this was going to be easy!) Actually, having a friend or loved one to support or share your goals provides both motivation and accountability. 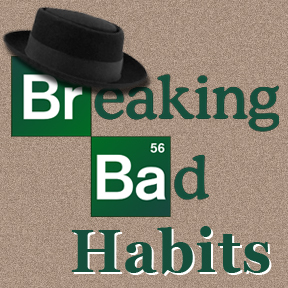 Essentially, a bad habit cannot simply be broken, but must be replaced with a good habit. We are most likely to give in to old habits when we are tired, hungry, bored or sad. Planning ahead is one of the most useful ways to help you stick to your plan. Don’t be hard on yourself if you do slip up and, remember, changes take time and effort so don’t judge yourself, feel guilty or stop trying. In fact, you may fail several times before you succeed. To help you stay on track, reward yourself for any changes you are able to make, no matter their size, and keep resetting your goals as you reach them. This entry was posted in Home and tagged Breaking Bad, Breaking Bad - Habits, Professional Supplement Center, Vitamins and supplements, www.professionalsupplementcenter.com. Bookmark the permalink.